Need a plumber in London? Welcome to The Handy Squad. 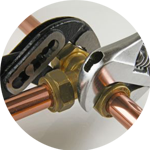 If you are requiring a London plumber you’ve come to the right place. Perhaps you need a professional plumber to fit washing machine or to change a tap washer – our expert plumbers will give you a hand and even offer same-day plumbing service. 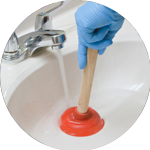 The Handy Squad offers Specialist Plumbing Services to both offices and homes in London. Our certified plumbers are able to complete a variety of plumbing jobs, from unblocking sinks to fixing a dripping tap, amongst many other tasks. Request a free quote today by filling out our online form or give us a call on 0800-0-12-12-12, we are always happy to help you with your plumbing needs. Our experienced plumber London team is ready to help with repairing any number of plumbing issues within your home and office. We are able to replace a tap washer, unblock toilets, fit an isolation valve in your home’s water pipes, or do a waste disposal unit installation. 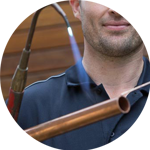 Looking for plumbers in my area or plumbing services near me? Our Areas Covered page shows you all the areas in London that our team covers. Our standard hours are 8am to 6pm, but you can also book us earlier in the morning as well as evenings and Saturdays. 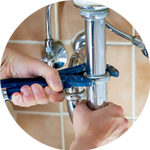 If you need a Plumber London Handy Squad has got the professionals perfect for you. Our plumbers in London have been dealing with blocked toilets and faulty radiators since 2005, so you can rest assured you’ll be in good hands. We’ll make sure any task you require will be done efficiently and in a timely manner. No job is too small nor too big, we take care of many jobs, such as replacing cartridges, unblocking drains and gullies, installing baths, showers and shower screens, repairing traps, wastes and plugs and installing white goods appliances. If you are looking for other Handyman services, The Handy Squad offers a variety of skills, from painting, tiling work, hanging doors, building bespoke shelves, repairing and replacing sockets, and much more. Contact our friendly team for an extra pair of hands by calling 0800-0-12-12-12 or by simply filling out our online booking form.